Aquatic ecosystems have received mercury released from anthropogenic sources. The northeast region of North America is at especially high risk because of local and regional emission sources, prevailing wind patterns, and certain hydrological and biogeochemical features. Here we examine regional variation in total mercury (Hg) in brain, liver, and fur from otter and mink collected across New York, New England, and Nova Scotia. Gender and age are examined as factors potentially affecting Hg tissue levels. In addition, temporal relationships are analyzed for New York as well as correlative relationships for tissues from Maine. Animals were collected from 1982 to 2003, mostly from licensed trappers. Liver was the only tissue from otter that exhibited significant regional variation (New York versus Maine) in Hg concentration. Mercury concentration was significantly related to age but not to gender for otter. All tissues in mink exhibited significant, but inconsistent, regional variation in total Hg concentration, with the highest mean Hg concentration in liver samples from Massachusetts/Connecticut. Female mink had significantly greater Hg concentrations in liver than males. Total Hg concentration in the liver of both otter and mink from New York decreased significantly with time. 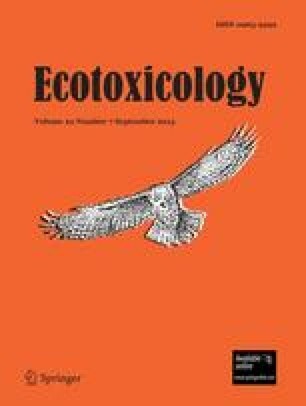 Correlations among tissues for Hg concentration were stronger for male and female mink and male otter than female otter from Maine.